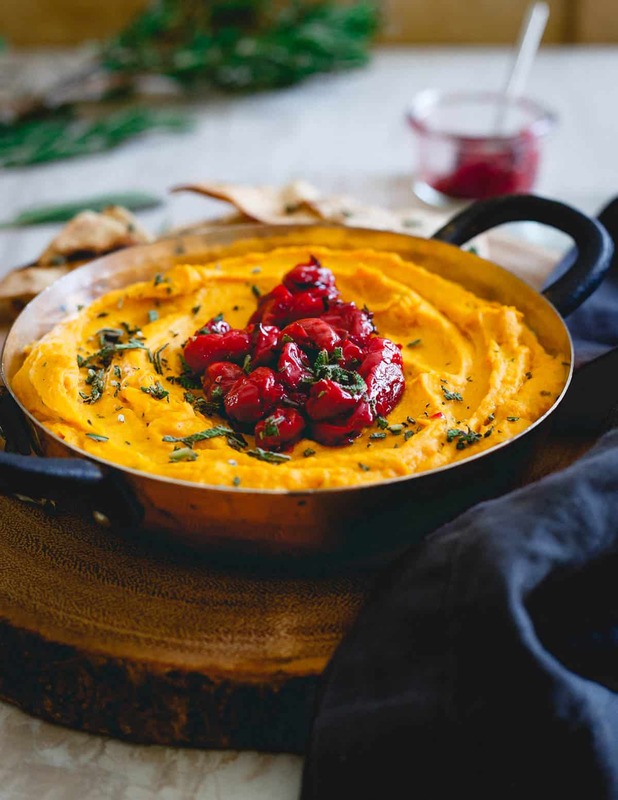 This butternut squash dip is made with goat cheese and cream cheese for a super creamy texture then topped with a festive Montmorency tart cherry compote. 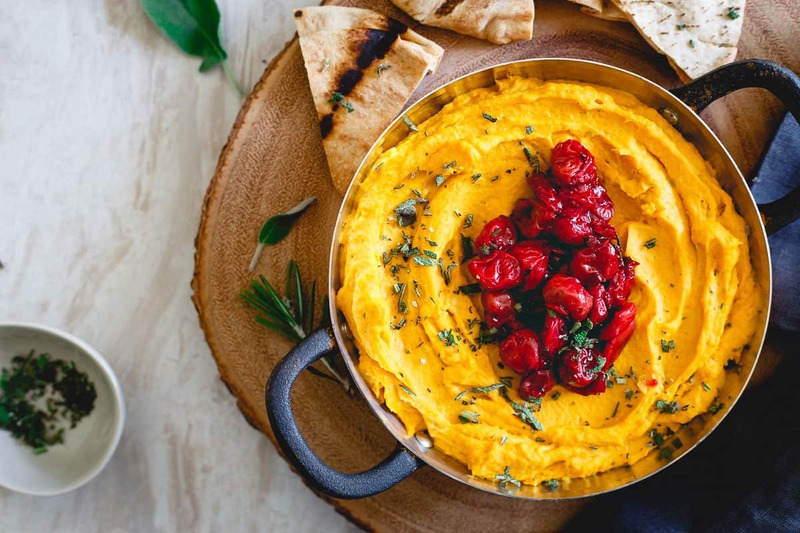 Serve it with some pita chips for the perfect holiday appetizer! 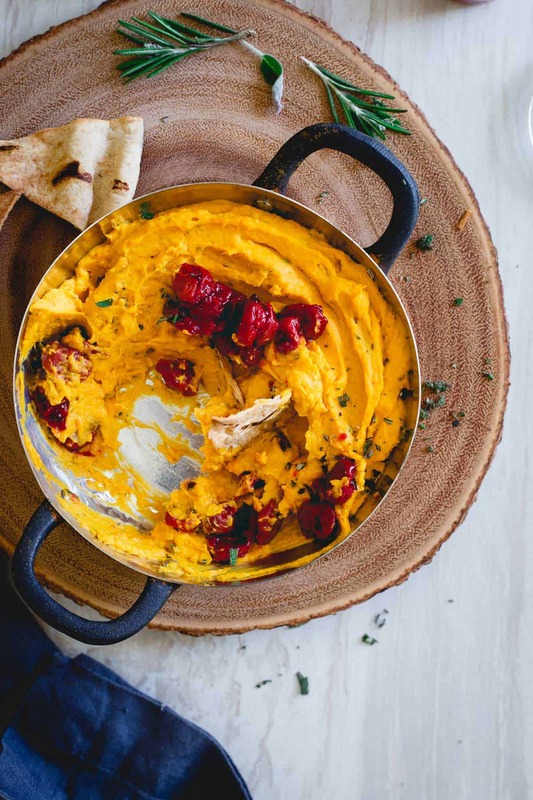 I sorta want to host a holiday party every week through New Years now that this butternut squash dip is in my life. I’m just gonna come out and say, it might be the best thing I’ve eaten all season. Last year at this time, I was doing my first “cut” diet with my nutrition coach, learning about macros and prepping for our vacation to Cabo right after the New Year. I promised myself when that was over I would never do a “cut” again over the holidays. The results were amazing but I wasn’t sure I had the willpower to resist all that holiday goodness ever again like I did last year. And then we went and booked a return trip to Cabo (I love it so much there) for the same time this coming January. Couple that with the cruise last month where I ate like I’d never see food again for 8 days straight and guess who’s cutting again smack in the middle of the holidays? I don’t usually bother calculating macros and figuring out how pathetically small my portion has to be of a lot of the foods I make this time of year because a. it’s just not worth it, I’d rather eat volume and feel satisfied (one of the few times in life quantity > quality) and b. eating those foods usually just triggers the desire to eat more of those foods and then you’re in a tailspin of cravings when you’ve got 4 weeks left until you plan on being in a bikini for 10 days straight. Not ideal. This butternut squash dip was different though. The minute I taste checked it for seasonings in the food processor, I knew calculations were in order because I was eating this damn dip. It’s creamy, cheesy, savory, herb-infused deliciousness broke me down. It’s pretty darn healthy in the grand scheme of things! Butternut squash is the new sweet potato. Better even, especially for those of us in a daily face off with carbs. With less than half the carbs of a sweet potato gram for gram, you get to eat a heck of a lot more deliciousness and that was music to my “cutting” ears. Now let’s discuss that tart cherry compote on top, perhaps my favorite part! 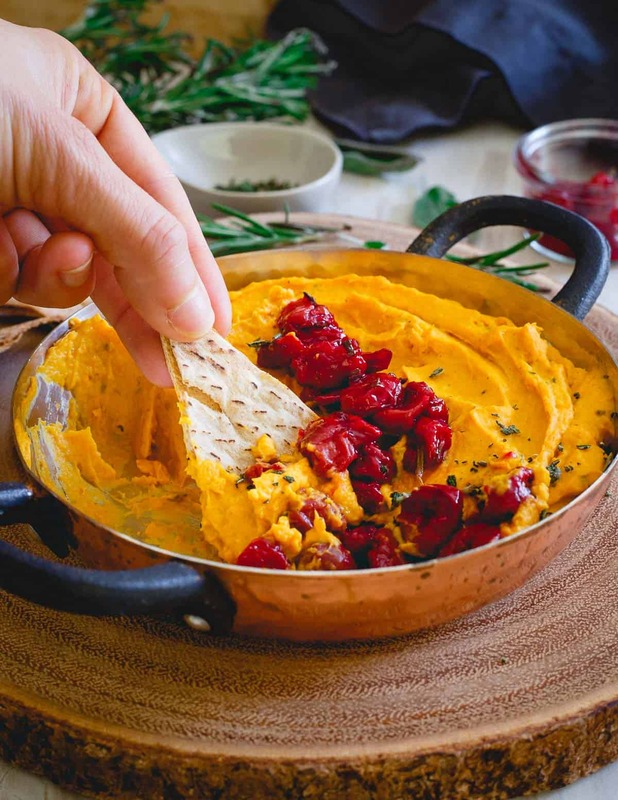 Montmorency tart cherries bring not only a festive punch of color to the top of this creamy butternut squash dip but a tangy sweet bite and some amazing health benefits as well. Their distinct sweet and sour flavor profile is actually indicative of the presence of anthocyanins, a compound that’s been linked to helping reduce inflammation like muscle soreness and arthritis pain. As someone in a constant state of soreness from workouts, I took that to mean this dip and I were destined for each other. Grab more seasonal tart cherry ideas like this kabocha squash soup with tart cherry drizzle or this goat cheese fried chicken with cherry tarragon sauce. So with my calculator by my side, I happily inhaled 1/3 of this perfect holiday appetizer while scheming excuses to make it again and again and again until squash season is over. 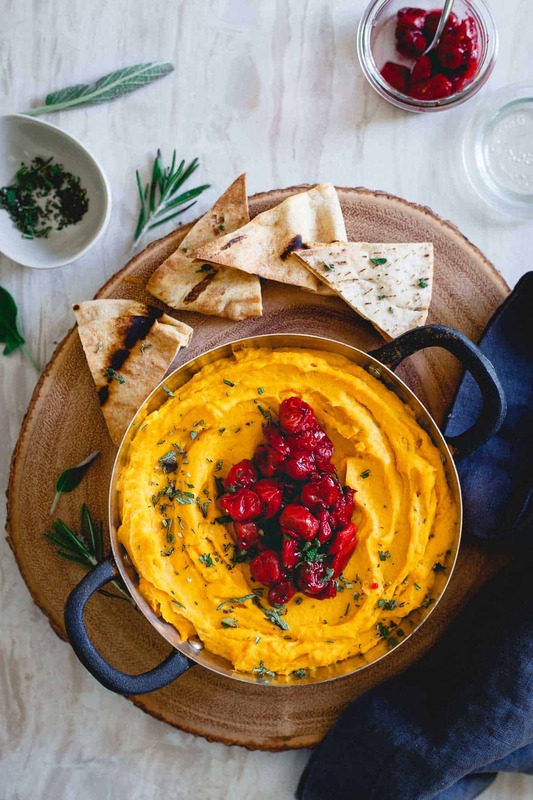 This butternut squash dip is made with goat cheese and cream cheese for a super creamy texture then topped with a festive tart cherry compote. Toss the butternut squash with the olive oil, salt, pepper and rosemary and spread out on baking sheet. Roast for 30 minutes until fork tender, tossing half way through. 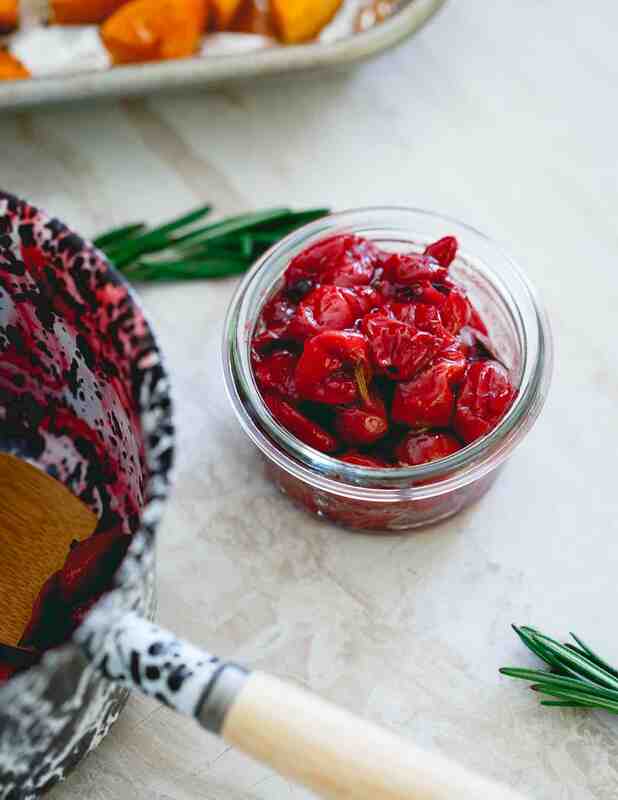 While the squash roasts, make the tart cherry compote by combining all ingredients in a small sauce pot over medium heat. Bring to a boil then reduce to a simmer and cook for about 10 minutes until reduced and thickened, stirring occasionally. Remove from heat and set aside. 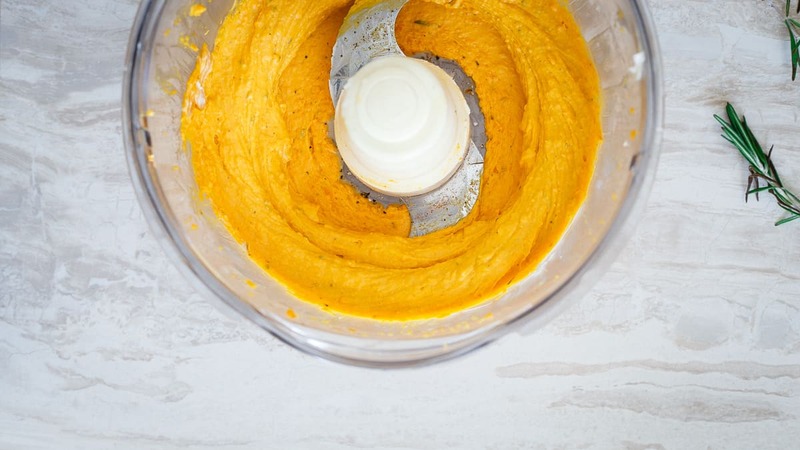 Add the roasted butternut squash to a food processor with the remaining ingredients. Process until smooth, scraping down the sides as needed. Transfer the squash mixture to a baking dish and smooth the top with a spatula. Bake in the oven for about 10 minutes until warmed through. 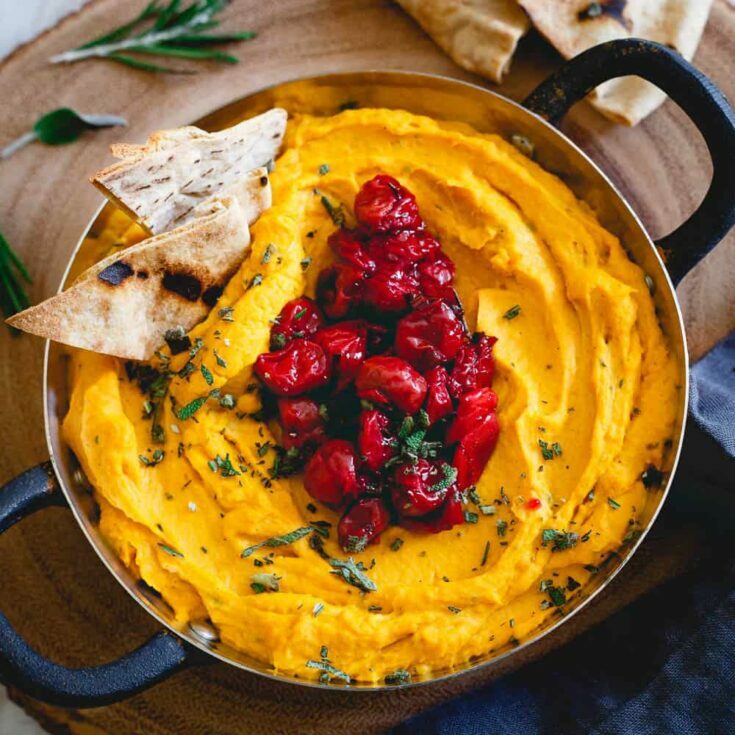 Remove the dip from the oven, top with the tart cherry compote and any extra chopped herbs. Serve warm with toasted pita wedges or vegetables. I love this flavor combo and it makes such a beautiful dish. It’s perfect for the holidays! I love the sound of this dip Gina! The cherry compote is the perfect topping too! Love the new blog design! That dip – i would eat it with a spoon! I love this dip!! It’s freaking stunning! 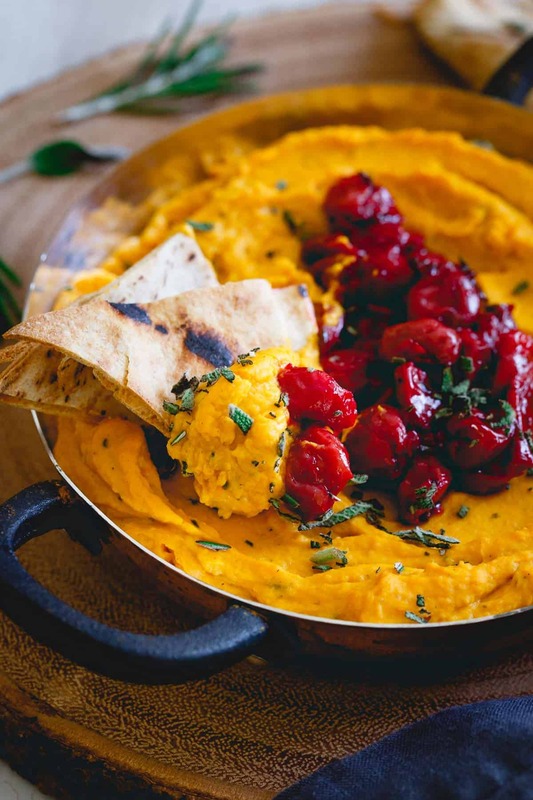 LOVE the butternut squash and that cherry compote! and Gina, your blog redesign is gorgeous!!! SO beautiful and clean! This is so pretty and I adore the flavors…I could probably eat the whole dip myself! Ummmm this might just be the best dip ever. All of my favorites!!! Just beautiful!!! I love the flavor combinations. The photos are gorgeous too, Gina! This dip needs to be in my life! Love the flavors going on and those gorgeous colors! Such a great appetizer for the holidays! Seriously the best dip ever!! I love the flavor combo on this dish. Seriously have to try this. Yum!! !